The former players of the team are- Ravichandran Ashwin, Murali Vijay, Matthew Hayden and Michael Hussey. The players of the team for this year includes: MS Dhoni (the captain), Suresh Raina, Faf du Plessis, M Vijay, Ravindra Jadeja, Sam Billings, Mitchell Santner, David Willey, Dwayne Bravo, Shane Watson, Lungi Ngidi, Imran Tahir, Kedar Jadhav, Ambati Rayudu, Harbhajan Singh, Deepak Chahar, KM Asif, Karn Sharma, Dhruv Shorey, N Jagadeesan, Shardul Thakur, Monu Kumar, Chaitanya Bishnoi. The team Kolkata Knight Riders is representing the city Kolkata which is the capital city of West Bengal. The team is owned by the bollywood actors Shahrukh Khan and Juhi Chawla. The team won over the trophy of IPL two times- on 2012, final against Chennai Super Kings and on 2014 against Kings XI Punjab. The team is coached by the head coach Jacques Kallis along with Simon Katich as the assistant coach. The captaincy of the team was started by Sourav Ganguly and was continued for two successive years (2008-2010). Later the captaincy was given to Gautam Gambhir who continued the captaincy till 2017. Since then Dinesh Karthik is given the title of captaincy of the team KKR. The tag line of the team is given as “Korbo Lorbo Jeetbo” and the theme colour of the team is purple and gold. The former players of the team includes- Chris Gayle, David Hussey, Laxmi Ratan Shukla, Angelo Mathews, Ricky Ponting, Wriddhiman Saha, Umar Gul, Ishant Sharma, Ashok Dinda, Ajit Agarkar, Murali Karthik, Brad Hodge, Ajantha Mendis and Charl Langeveldt. The present players of the team for this year are- Dinesh Karthik, Robin Uthappa, Chris Lynn, Andre Russell, Sunil Narine, Shubman Gill, Piyush Chawla, Kuldeep Yadav, Prasidh Krishna, Shivam Mavi, Nitish Rana, Rinku Singh, Kamlesh Nagarkoti, Carlos Brathwaite, Lockie Ferguson, Joe Denly, Harry Gurney, Nikhil Naik, Shrikant Mundhe, Prithvi Raj Yarra, Anrich Nortje. The team Mumbai Indians represents the city Mumbai, the capital city of Maharashtra. The team is officially owned by India’s biggest business tycoon Mukesh Ambani and Nita Ambani of Reliance Industries. The team won over the trophy of IPL three times- on 2013 against Royal Challengers Bangalore, on 2015 against Chennai Super Kings and on 2017 against the Rising Pune Supergiant. Mahela Jayawardene has been chose as the head coach of the team along with Paras Mhambrey as the assistant coach, Robin Singh as batting coach and Shane Bond as the bowling coach. The tag line of the team is “Akkha Mumbai Khelega” and the theme colour is blue. The team Mumbai Indians is regarded as the one of the most successful IPL team. The players of Mumbai Indians for this years includes- Rohit Sharma, Hardik Pandya, Jasprit Bumrah, Krunal Pandya, Ishan Kishan, Suryakumar Yadav, Mayank Markande, Rahul Chahar, Anukul Roy, Siddhesh Lad, Aditya Tare, Kieron Pollard, Evin Lewis, Yen Cutting, Mitchell McClenaghan, Adam Milne, Jason Behrendorff, Quinton de Kock, Barinder Singh Sran, Lasith Malinga, Yuvraj Singh, Anmolpreet Singh, Pankaj Jaswal, Rasikh Dar. For this year, the team has set up with the players – Virat Kohli, AB de Villiers, Parthiv Patel, Yuzvendra Chahal, Washington Sundar, Pawan Negi, Nathan Coulter-Nile, Moeen Ali, Mohammed Siraj, Colin de Grandhomme, Tim Southee, Umesh Yadav, Navdeep Saini, Kulwant Khejroliya, Marcus Stoinis. On the Auction for this year, they included the players- Shivam Dube , Shimron Hetmyer , Akshdeep Nath , Prayas Barman , Himmat Singh, Gurkeerat Singh Mann, Heinrich Klaasen , Devdutt Padikkal , Milind Kumar. The team Rajasthan Royals represent the state Rajasthan. The team is owned by Manoj Badale and Ranjit Barthakur. The first captain of the team was Rahul Draid from 2008. After his retirement from the cricket tournaments, the captaincy was given to Shane Warne. But at present the captain of the team is Ajinkya Rahane an also he is the top run-scorer of the team. The theme colour of the team is blue and golden. They were successful in winning over the title of IPL on 2008. Paddy Upton is chosen as the head coach of the team along with Sairaj Bahutule and Steffan Jonesas the bowling coach, Amol Muzumdar as the batting coach and Dishant Yagnik as the field coach. The current players of the team Rajasthan Royals includes – Ajinkya Rahane, Krishnappa Gowtham, Sanju Samson, Shreyas Gopal, Aryaman Birla, S. Midhun, Prashant Chopra, Stuart Binny, Rahul Tripathi, Ben Stokes, Steve Smith, Jos Buttler, Jofra Archer, Ish Sodhi, Dhawal Kulkarni, Mahipal Lomror, Jaydev Unadkat, Varun Aaron, Oshane Thomas, Ashton Turner, Liam Livingstone, Shashank Singh, Riyan Parag, Manan Vohra, Shubham Ranjane. The team Kings XI Punjab represents the city Mohali of the state Punjab. This team is owned by Preity Zinta, Ness Wadia, Mohit Burman, The Oberoi Group and Karan Paul altogether. Yuvraj Singh was chosen as the captain of the team at the beginning and continued till 2010. After that the captaincy was given to Adam Gilchrist on 2011 and then to Virender Sehwagon 2015 after his retairement. But previous year the captaincy was given to Ravichandran Ashwin who will the continuing as a captain of the even in this season. Mike Hesson is the head coach of the team along with Ryan Harris as bowling coach and Craig McMillan as fielding coach. The theme colour of the team is red and silver white. The team Sunrisers Hyderabad represents the city Hyderabad of Telengana. The team is owned by Kalanithi Maran of the Sun TV Network. The team entered to the IPL on the place of Deccan Chargers who existed from 2008-2011 in IPL represented the Deccan states. Kane Williamson is the captain of the team for the present season. The team consists of stronger players such as David Warner who is the highest run-scorer of the team and also Bhuvneshwar Kumar who is the highest wicket-taker of the team. The team won over the trophy of the IPL once on 2016. Tom Moody is the head coach of the team with Simon Helmot as the assistant coach. The theme colour of the team is red and black. The present players of the team includes – Jonny Bairstow, Wriddhiman Saha, Martin Guptill, Basil Thampi, Bhuvneshwar Kumar, Deepak Hooda, Manish Pandey, T Natarajan, Ricky Bhui, Sandeep Sharma, Siddarth Kaul, Shreevats Goswami, Khaleel Ahmed, Yusuf Pathan, Billy Stanlake, David Warner, Kane Williamson, Rashid Khan, Mohammad Nabi, Shakib Al Hasan, Abhishek Sharma, Vijay Shankar, Shahbaz Nadeem. 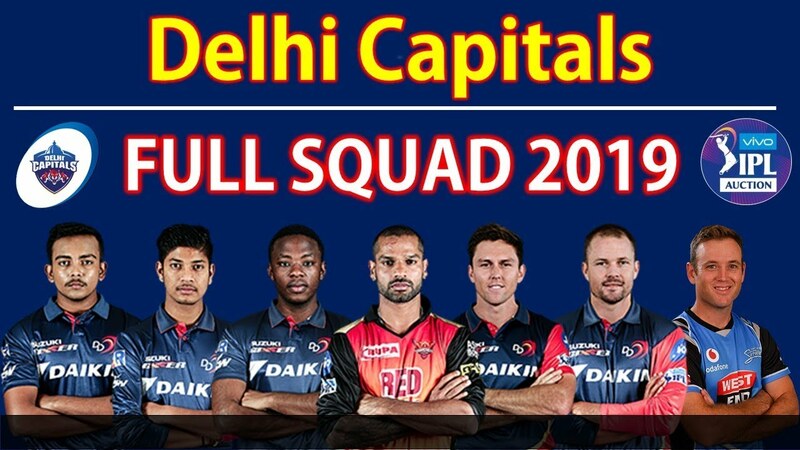 The team Delhi Capitals represents the capital state of India Delhi. The team was founded on 2008 and was known Delhi Daredevils till 2018. The is owned by the partnership of Parth Jindal of JSW Group and Kiran Kumar Grandhi of GMR Group. Ricky Ponting has been chose as the head coach of the team with Mohammad Kaif as the assistant coach of the team. This year the team have come up with the new theme colour and team logo. Shreyas Iyer is chosen as the captain for the team this season due to the retirement of Gautam Gambhir who was the captain of the team on 2018 after he got evicted from Kolkata Knight Riders. The current players of the team are – Jalaj Saxena, Ankush Bains, Nathu Singh, Sherfane Rutherford, Ishant Sharma, Bandaru Ayyappa, Sandeep Lamichhane, Trent Boult, Shikhar Dhawan, Manjot Kalra, Colin Ingram, Axar Patel, Hanuma Vihari, Colin Munro, Chris Morris, Kagiso Rabada, Harshal Patel, Rahul Tewatia, Jayant Yadav, Shreyas Iyer, Rishabh Pant, Prithvi Shaw, Amit Mishra, Avesh Khan, Keemo Paul.